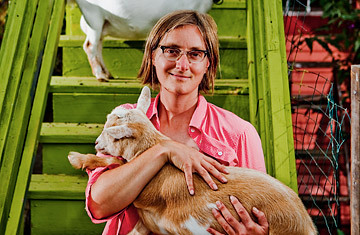 Novella Carpenter who lives in Oakland, California with dwarf goats. Nigerian dwarf goats grow to only 21 in. tall, about equal to a medium-size dog. "But they have giant udders," says Novella Carpenter. She should know: she has six goats that together provide a quart of milk a day, which she drinks and uses to make cheese and butter. And when the bleating beauties are not grazing in her 1,000-sq.-ft. yard, they're hanging out on the porch of her second-floor apartment in the middle of Oakland, Calif.